Twenty stunning tapered baguette diamonds, at approximately .35 carat TW, create a bold and elegant statement. These magnificent, hand-matched stones are further accentuated by 68 round diamonds, at approximately .39 carat TW, pavé-set into the edges and sides of this modern 7mm cathedral design. The total diamond weight is approximately .74 carat. The sparkling setting is crafted from superior quality 14 karat white gold. Add the center diamond of your choice. I LOVE this ring, but I only gave it a 3 star rating. I did this for a couple of reasons. 1. There was no matching wedding band to go with it. 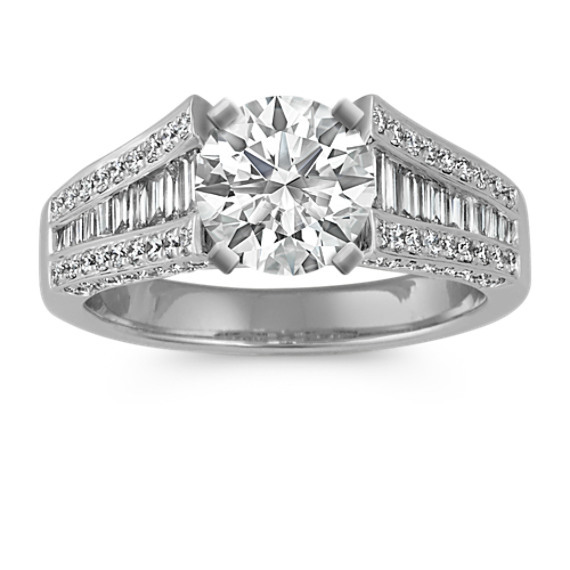 We searched high and low for something to go with it and ended up with a set of 2 bands 64 diamonds (knife edge). So we mounted these bands 1 on each side of this ring so the side diamonds of this engagement ring are hidden which is really kinda of a shame. 2. The other reason is that the smallest baguettes on both sides of this ring always end up getting really dirty and end up looking black. If you look really fast it almost appears as if these 2 smallest baguettes are missing. At first it use to scare me. Now unfortunately, I live over 2.5 hours away from the nearest Shane Company so it's really difficult for me to keep going and getting cleaned as often I would like so it really looks like these diamonds are missing all the time which is really disappointing. 3. The other disappointing factor about this ring, was when we were choosing the center stone, we had to go with lower color than we really wanted. I originally had another stone that we were trading in and the color of that stone of was an H but it was a Marquise cut and it didn't look good in this setting and we really wanted an Emerald Cut. We were looking colors like D, E and F but they looked absolutely horrible in this setting. They didn't look real, they were too blue and just looked terrible in this setting. We had to knock the color back down to and I before it looked like it belonged in this setting, so that's what we went with.